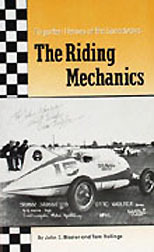 This book is a roster of names for researchers, historians or dedicated race fans. All the riding mechanics are listed with the drivers they rode for. Only a few are missing in the early years.